Previously, a report claimed that the Motorola One Power would be the second Android One powered smartphone from Lenovo. Earlier the renders of the phone were surfaced which revealed its design and few key specs. 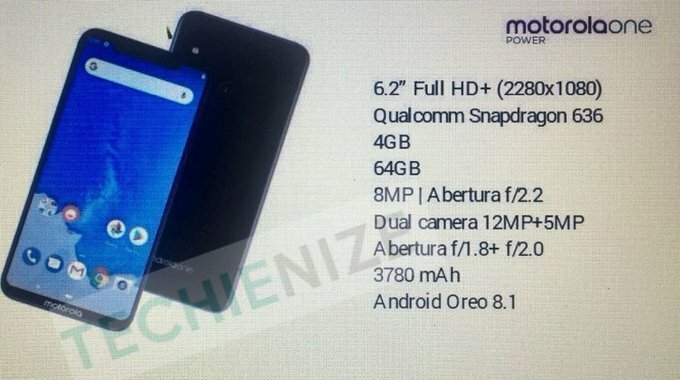 And now, another leak has surfaced which reveals almost all its major specifications. According to the leak, Motorola One Power will sport a 6.2-inch Full HD+ 19:9 display with the resolution of 2280 x 1080 pixels and a notch. The phone will also have narrow bezels and a chin including Motorola logo in the bottom of it. The device will be powered by an octa-core Snapdragon 636 SoC along with 4GB of RAM, and 64GB internal storage. However, if earlier rumors are true, then the device will also have a higher 6GB RAM variant as well. Motorola One Power will feature 12MP + 5MP dual rear cameras setup with f/1.8 and f/2.0 aperture respectively. The cameras are vertically aligned along with a LED flash which resides between both sensors. On the front, there is an 8MP Selfie camera with f/2.2 aperture. Reportedly, Motorola One Power will run on Android 8.1 Oreo out of the box and packed with a 3780mAh battery to power it. The phone will also have a circular fingerprint scanner with a Motorola logo embedded on it. It will be an Android One powered smartphone which will receive regular monthly security patches and at least two major Android updates as well.